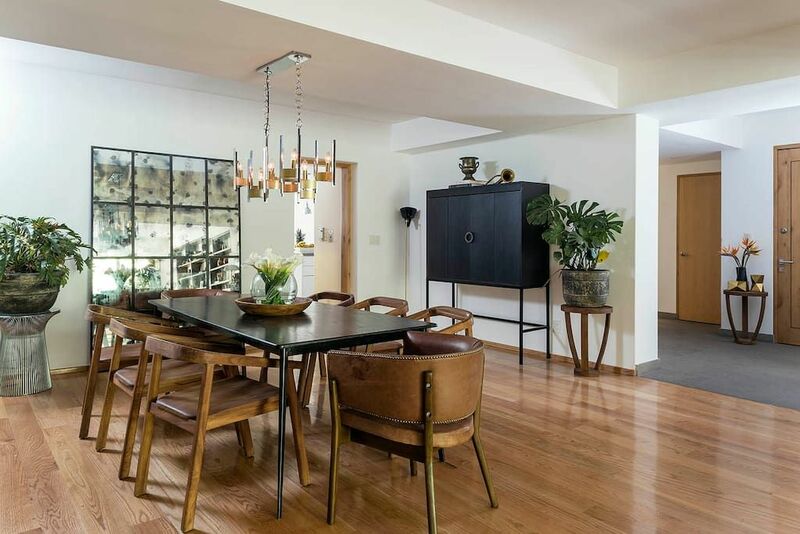 Introducing a truly special, tastefully decorated 3-bedroom apartment with delightful balconies looking into the Chapultec woods in Mexico City s safest & most upscale neighborhood. Steps from Masaryk Avenue, the Anthropology & Contemporary Art Museum. Located in a first class building, offering 24hr security and elevator to your door. Ideal for families, groups or colleagues traveling together. This very spacious apartment is the perfect place to call home while visiting Mexico City. It offers a very generous living room, glamorous with a "put up your feet" comfort style, where guests can gather an relax. The dinning room offers seating for 8 guests. A large kitchen is the center of the apartment, fully equipped with top of the line appliances, connects with the family room where guests can watch movies in the 60in TV. Two master bedrooms with walking closets are set one on each side of the apartment. The third bedroom offers ensuite as well, and large closet space. 1 Queen Size bed (set up here for groups over 6). SERVICE: Daily cleaning service (with the exception of Sundays) is available with additional cost. A profesional cook or chef may be booked with additional charge to prepare a special meal for your group, family or clients. * Airport pick up is available* *Please request a quote on our added services. Daily cleaning service (with the exception of Sundays) is available with additional cost. *Please request a quote on our added services. Our team is available 24/7. Whether is me, my hosting partners or our associates, your comfort is our priority. This area of Polanco is one of the most sought after because of the neighboring park, locals enjoy jogging or walking their dogs in this tree filled area.